045 – This is Spinal Tap. | All Eighties Movies. All The Time! 045 – This is Spinal Tap. 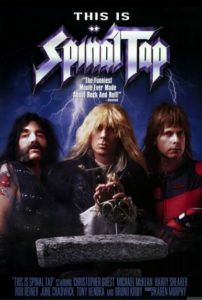 Taking it to Eleven this week as Gidgit and Angry laugh their way through one of the all time great comedy classics as we join Spinal Tap on the road and the return to greatness! 2 Responses to 045 – This is Spinal Tap. Hilarious. I listened in the car and was laughing and singing so much people in the cars next to me were staring at me. Worth it. Well done both of you. I got home and watched it again then listened to your pod cast again. Thanks guys. I’m really liking these podcasts. You all are enjoyable to listen to.